Snake Kachina," by Nate "Natron" Smith. 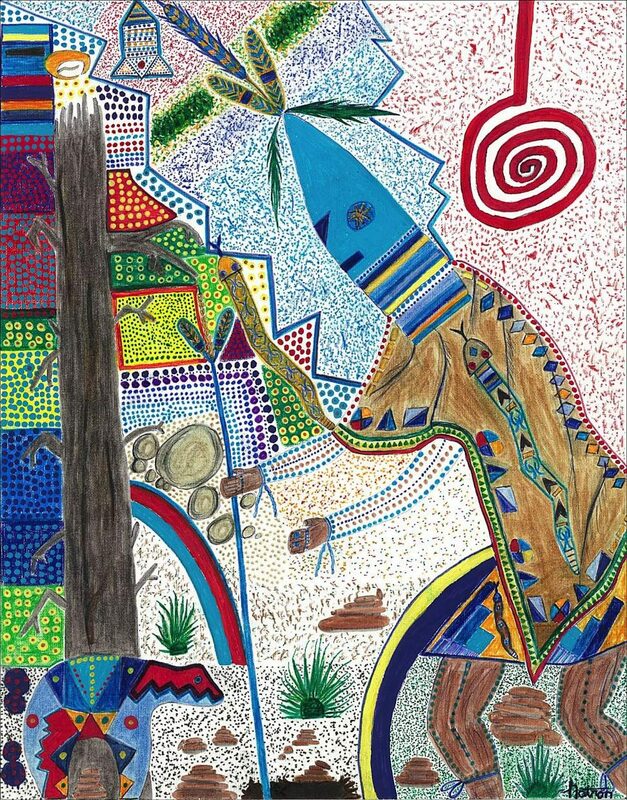 "Iâm inspired by kachinas, their colorful costumes and their spiritual figures," Smith said. "Theyâre intermediaries between humans and the Great Spirit. Iâm fascinated by the culture of that. What: “Abstract Visions of Beauty,” 40 mixed-media pieces by Nate “Natron” Smith. When: Exhibit runs through Friday, Sept. 30; library hours are 10 a.m. to 8 p.m. Monday through Thursday and 11 a.m. to 6 p.m. Friday through Sunday. Where: Vail Public Library, 292. W. Meadow Drive, Vail. More information: Find Vivid Vail Art on Facebook or at www.natesmithweb.wordpress.com, or call 970-470-1732. VAIL — Sometimes, your life’s path isn’t a straight line from Point A to Point B. Much like the geometric shapes in his colorful, abstract pieces, Nate “Natron” Smith’s avenue to becoming a professional artist has taken a more curvilinear route. As a kid growing up in the Milwaukee area of Wisconsin, Smith’s mother would take him on weekly treks north to Door County, an artist colony known for its painters, potters and glass blowers. The two would tour the various galleries, searching for unique pieces. “She collected Australian aboriginal art, art from Africa that’s super cool, Indian art — it was a mixed collection from all over the world,” Smith said. Smith enrolled in college, majored in sociology and eventually found his way to Colorado to follow his passion for skiing. It wasn’t until years later when he inherited some of his mother’s art and began looking at it in a new way, from the native themes to the processes used to produce each work, that he began to consider a creative path. Using mainly pens, pencils and markers, Smith experimented, creating pieces full of vibrant color and mixing realistic figures with abstract backgrounds. His work wandered, with “no real focus,” he said, until he produced a few images of famous alpine skiers Hermann Maier, Mikaela Shiffrin and Ted Ligety for the 2015 World Alpine Ski Championships in Beaver Creek. He sold some prints of the pen and marker drawings, and it jump started his desire to pursue art more seriously. In December, he joined the Vail Valley Art Guild, which he said has “been a positive energy exchange” and has taught him more about what it takes to be a professional artist. Smith’s newer work uses the deep hues of oil paint, a bit of the thick richness of acrylic and some inks, even adding wood stains to a few of his pieces to create more texture. “There’s endless combinations, and I like the mixing because it gives different levels of contrast,” he said. “I love oil the most; I’m trying to do 80 to 90 percent in oil because of the three-dimensional factor and the way it reflects the light. The combination of medias imparts the bold style that’s become his signature. If you’re into the subtle colors of watercolor or pastels, you probably won’t be drawn to Smith’s work, the artist said. Thematically, Smith is drawn to the native art that first inspired him to pick up pen and brush. He’s in the midst of creating a series of kachina paintings using pointillism, and he’s constantly inspired to draw out the beauty of nature in a whimsical, upbeat fashion, infused with positivity. “I’m a white guy doing Indian art, but it flows out of me like a river in the middle of the night. It’s like somebody’s there pushing my hand,” he said.